An April moon lit morning, the last weekend of wild turkey season. I arose before the sun, the full moon's glow is lighting the whole outdoors making it difficult for a rested person to sleep. The coffee is percolating on the stove, as I think about this mornings turkey hunt. A light fog is lifting from the ground, about head high, as I listen for a turkey gobble. None to be heard this foggy morning. The end of the season has never been productive for me. 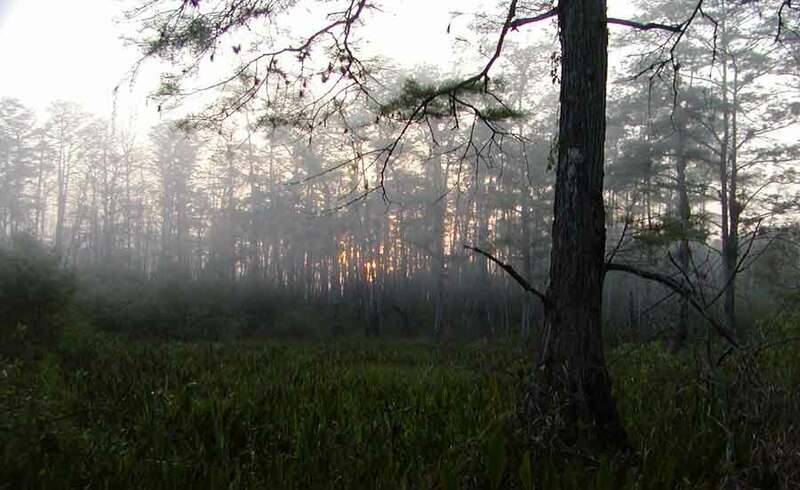 The biological turkey season starts early in the Big Cypress Swamp. Much earlier then the hunting season begins. This year the gobblers had their harem of hens by the time the hunting season opened, making it very difficult to call a gobbler to his demise. By the end of the hunting season, the turkeys are gobbled out, the biological season long over. Not hearing a gobble in the early light, I decide to do something different this morning. 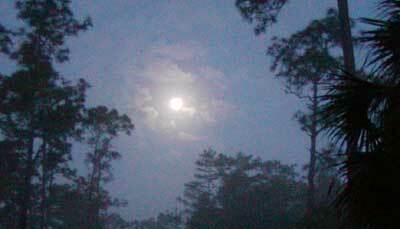 As the morning moon light switches to a faint glow of the sun coming up on the east horizon, I head north from camp. The Big Cypress Swamp is in a drought again this year, the water table has dropped lower then usual. April is cool, pleasant weather and a good time to explore the deep swamps, so I decide to forget the turkeys and explore the cypress heads, doing a little gator hole count to see just how bad the conditions are for the gators right now. 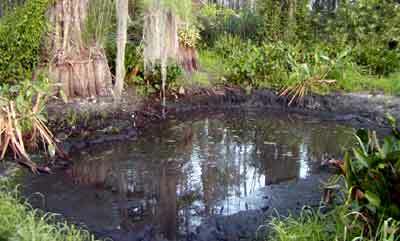 I know the location of several gator holes nearby, having found them over the years of swamp exploring. The first is nearby and usually dries up early each year and that is the case this year. The second is further away and in normal years has an alligator in it. This is not a normal year though and it is dry. The typical hole in the bank that gators retreat to in the pond is clearly dry. The mud is still soft with footprints of thirsty animals looking for a drink. But the drink is not to be found here, so I move along. I see a cypress head that I have not explored before and I enter it just as the glow of the sun is breaking the horizon. 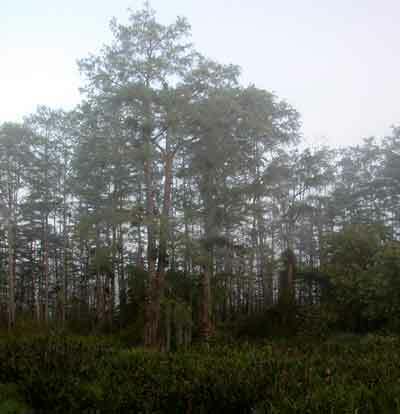 A pretty sight, with the fog lifting from the green foliage of the ponds center. I follow a beaten path toward the center that animals have been using for years. In the center I find a low dry area, this too covered with animal tracks looking for water. Turkey here, deer there, water bird tracks with their long, thin toes, but no water. 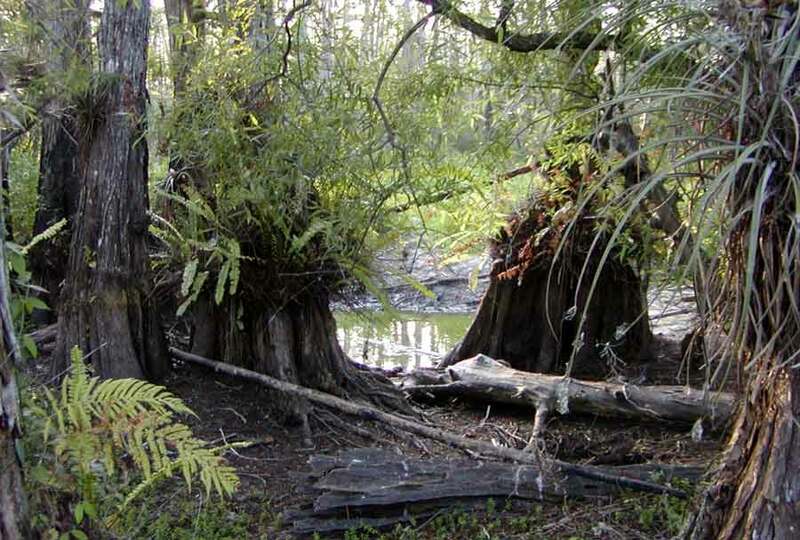 Seeing a area of willows and knowing this sometimes has a gator hole in it, I press forward, the soft mud's suction trying to steal the boots from my feet. 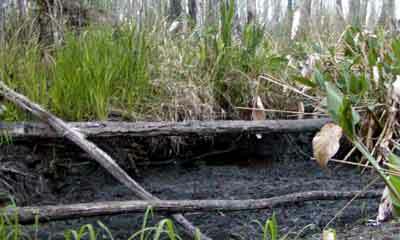 I struggle to move in the soft mud, trying to step on roots of the pickerel weed for a little support. This stand of willow trees have a animal path through them, but no gator hole here, just lush green vegetation, growing in the soft moist mud. I backtrack, then stand enjoying the view from the center of the pond. Not a view you can enjoy after the rainy season starts, without standing in waist deep water. 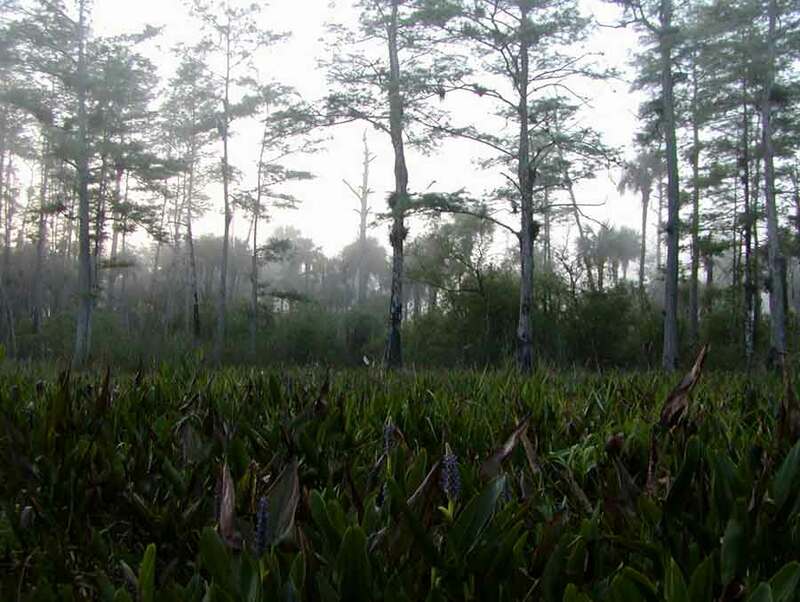 The pickerel weed having had a head start on the growing season is lush and green, with the tall, straight cypress trees ringing the cypress pond. Behind in the distance is a pine island with the lower palmetto bushes hidden by the distance. Its quiet, not a quiet that can be found in the city, but one that is found by being more then a dozen miles from the nearest road. A quiet that is found by being alone, with no one else nearby for miles, the only human footsteps to be heard being your own. I find that most people are not comfortable with that situation. You have to have self confidence to be that alone in the swamp. A confidence that a lot of people don't have. Enjoying the sounds of small birds awakening to the morning, I notice that most of the bird songs are coming from a couple of tall cypress trees on the edge of the cypress pond. Large trees with big bases and knees, ferns and bromeliads growing above the normal water line. 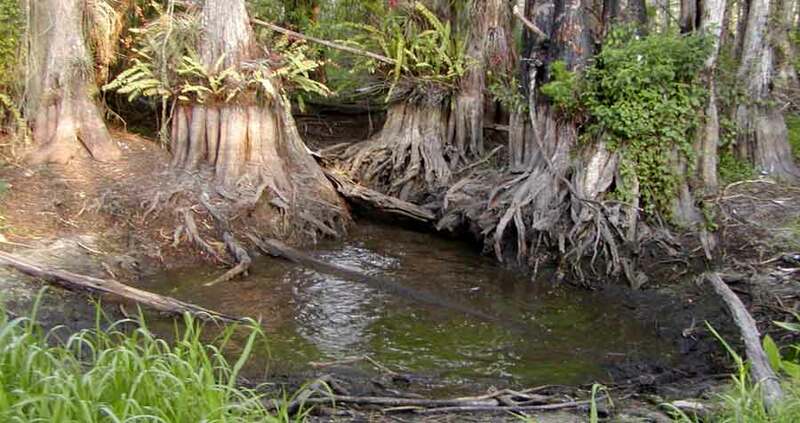 Majestic trees that escaped the logging of the Big Cypress in the 1940's. 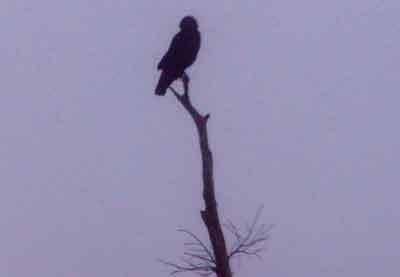 I edge over that way, watching some black birds flit from limb to limb. More pickerel weed, more mud to cross as I go slowly taking pictures here and there of things I find interesting. So what is attracting the birds? 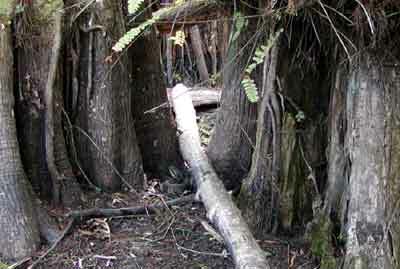 A gator hole of course, right on the edge of the cypress dome, rather then in the middle. Who would have known? I can't see the gator, it having known I was there long before I could see the water. Slipping back into the den in the hole in bank which is most likely under the cypress tree roots, the gator is not to be seen. The thick algae rich water looks almost thick enough to walk on, but of course it is not. Nether is the mud on the edge of the water, soft and filled with animal tracks, it is the perfect hunting ground for the gator. Stealthily the gator will lie below the thick green water, waiting for the vibration of footsteps in the thick mud. the soft mud not being a good place to spring from danger, thirsty animals when not careful enough, provide a meal for the gator. The gator in turn, wallows out the mud, down to below the water table, thereby providing water to the thirsty critters of the swamp. The gator provides water to many more critters then he can catch and eat, so it is natures way of providing water and survival in the swamp during the dry times. 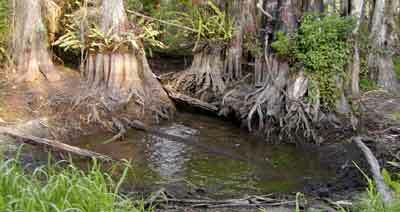 Not wanting to be an alligator meal my self, I carefully walk by the water on the more firm mud above the water level. Not afraid, but cautious, I don't linger near the waters edge. Not having seen the gator, but knowing he is definitely there somewhere, it seems best to not be in its strike zone. So standing back from the waters edge, I wait to see if the gator will show itself. I spend time watching a small flock of black birds trying to catch a morning meal and themselves deciding if the risk of being eaten, was worth a morning drink. I decide to move on, maybe the next gator hole will have a less elusive alligator. I cross a prairie, years ago open, but now filled with small cypress trees. 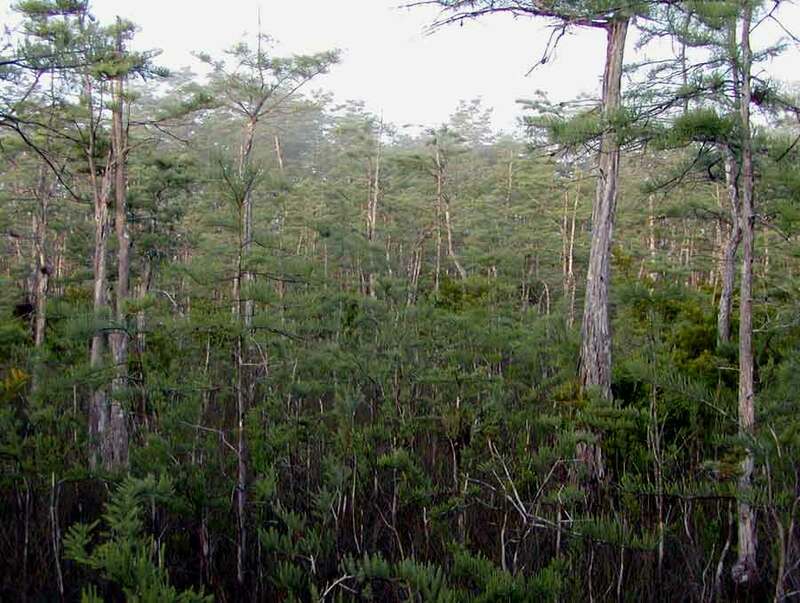 After all the Big Cypress Swamp is named after the number of cypress trees growing there, not the size of the cypress trees growing there. I head for another gator hole I know exists. This spot has never been dry when I checked it in the past. I know that a large gator always makes its home there, in the spring time of the year. Since I know where it is I can approach it slowly and stealthily giving me a chance to slip up on the gator. A quiet approach, which means extra quiet, when it is as quiet as it is in the swamp. Careful not to step on twigs or brush against branches the sound of which would give me away, I finally get near the waters edge and can see the gator. This gator is a big one, not so wary as the smaller ones. I am sure this is a male gator. It has a confidence found in large gators that have learned when you are big, you don't have to give way to any other creatures. Fortunately, wild alligators have a wariness of man, when they don't, that is when they are most dangerous. This one is not retreating, it is staying on the surface watching for me as I edge around its water hole. It knows something is there, but has not seen me and realize it is a man, the most feared creature in the swamp. I too am looking around, gator holes have no shortage of snakes. 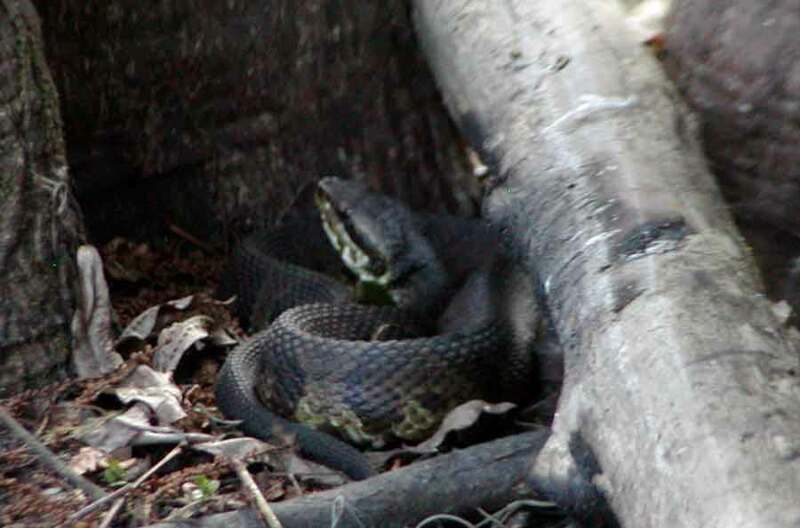 the water being an attractant, many gator holes have a large number of snakes hanging out nearby. As I edge around to the more open side of the gator hole, it spots me. I'm distracted looking for snakes and with a large splash that startles me, I'm back to paying attention to the gator. The gator had decided it was time to get in its hole in the bank and a large log was in the way. I turned just in time to see it splash over the log with its tail thrashing and water being splashed everywhere. A large fat gator. It may be a drought, but this gator is evidently eating well. I guess its exchange of drinking water for the thirsty, for an occasional meal is working out well for it. After my heart rate settles down to something more normal, I decide to move back to where I approached the gator hole. I will sit on a log and drink a cup of coffee, waiting for the big guy to come to the surface again. I would like to see if I can get a picture of him So I sit down and get my coffee out, enjoying the morning. 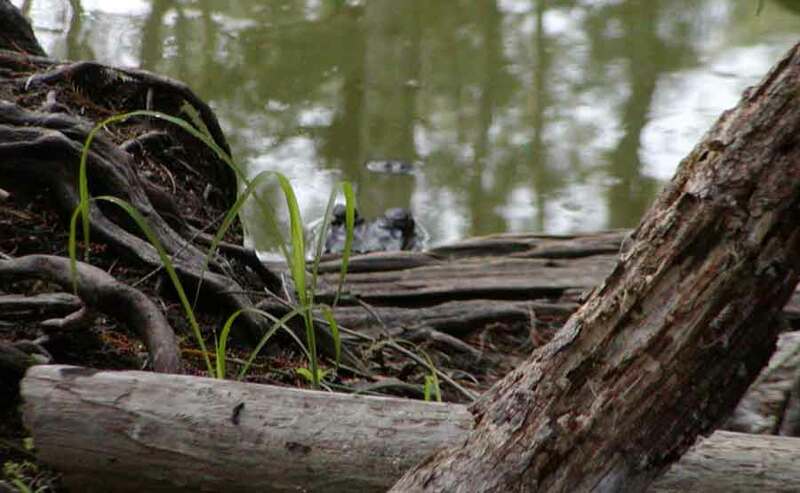 Looking around at the details of the cypress and enjoying the part of the swamp that is usually below water, my eyes settle on a water moccasin that is enjoying sitting on the other end of our log. It is coiled up, enjoying the morning just as I am. I am in its habitat, and as long as he stays over there, I will stay over here and we will get along just fine. After my second cup of coffee and about 15 minutes go by, the gator pops back up, letting me get his picture. I pack up and wishing the moccasin well, I head back toward camp. Its a bit of a walk, pleasant on a fine April morning, breakfast awaits, more coffee, a few chores and then off to visit a neighboring camp. Solitary time is good time in the Big Cypress Swamp, so is enjoying it with other sportsmen.